"Both the heart and the stomach thrill to … an old fashioned rice pudding that makes magic of just milk, rice and sugar", wrote Terry Durack in the The Age Good Weekend Magazine this weekend just passed. It is a lovely piece that articulates the Australian attitudes to puddings. They are not as the English seem to think, “anything served at the tail end of the meal”. Puddings are sweet, sticky, stodgy, steamy mounds of nostalgia. They are warm with dense, cake-like crumb, plump dried fruit, sweet stewed fruit and never complete without a sauce or cream of some sort. This is comfort food as mum made it. 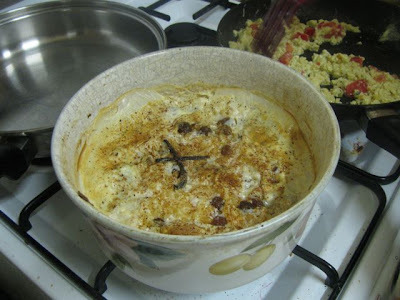 I made rice pudding on Sunday night. 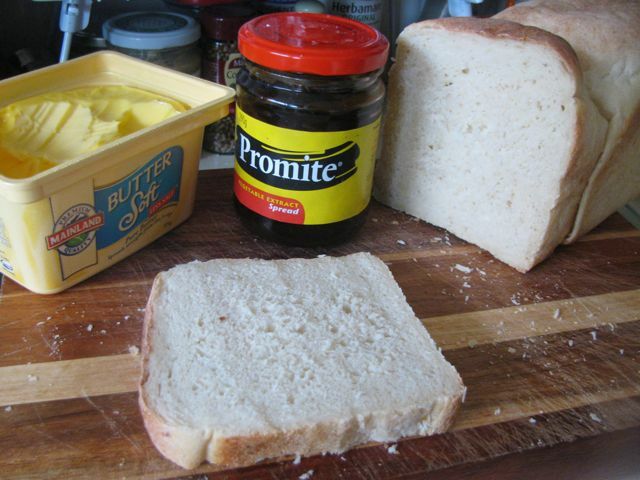 E has been hankering after it because he remembers his mum making it for him as a child. I asked his sister HH about it and she said yes she remembered it cooking such a long time that she would smell it when she got home from school. Like my mum’s, it was filled with creamy sweet clumpy rice and plump sultanas under a brown skin. I was never crazy about my mum’s rice pudding. But making just the sort of pudding we had as children filled me with nostalgia and it tasted just so good. It made me think of the 9 of us seated around the big wooden table with our spoons by us, watching my mother with a stack of dessert bowls and a large serving spoon ready to dig into the a steaming dish of rice pudding. She gave each bowl of rice pudding a splash of milk and a sprinkle of sugar before passing it out to us. I remember our old yellow plastic sugar bowl but I can’t remember if she put the milk in a jug. I’m not the only one to find it evocative. E loved it. I asked if it was like his mum’s and he said his mum’s had even less liquid but was very similar. (Whereas I thought my mum’s was a little more creamy.) We expected Sylvia to eat it because she loves rice and sweet food but she just picked out the sultanas. Maybe one day she will learn to love it. 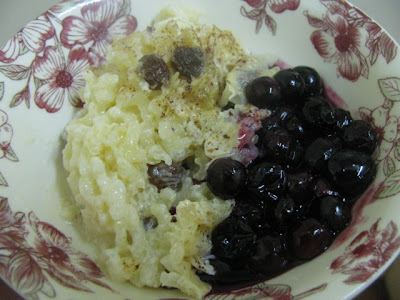 Despite the rice pudding being a trip down memory lane, I was aware that I have changed and I felt that it needed stewed fruit after seeing Nigel’s rice pudding with poached damsons. Being winter here, stewed apple and/or rhubarb seemed quite fitting but I had blueberries in the freezer and made a quick sauce with them. It is not the first time I have revisited rice pudding. Last time I veered even further from my mum’s with a chocolate rice pudding made on the stove top. Lately when talking to my mum she told me that rice pudding on the stove top was actually called creamed rice. 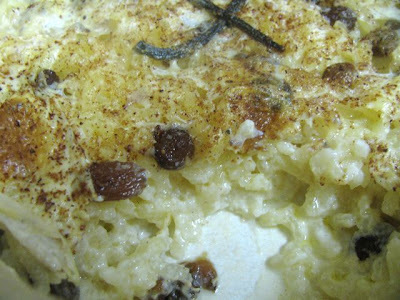 Traditional rice pudding is cooked slowly in the oven. It is so easy that I could put in the oven and go outside to play with Sylvia while it cooked. Eating such family dishes bring about such comfort through filling the tummy and nurturing the soul. They are not just about our childhoods but they connect us to our foremothers. My mum learned a lot of her cooking from her own mother. My grandmother is very much in my thoughts at the moment after visiting her in hospital yesterday. She would be proud of my rice pudding. Mix milk, rice and sugar in a greased medium baking dish. Add vanilla essence if using. 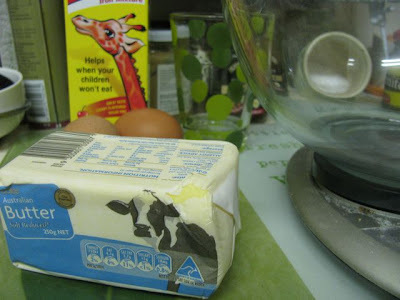 If using a vanilla bean, slice it in half and scrape the insides into the milk mixture. Mix and then place the bean pods on top of the mixture. Dot with butter. Bake at 160 C (or 170 C if like me you have a slow old oven) for about 1 hour. Remove from oven and grate nutmeg over the top. Return to the oven for another 20 minutes. It is ready when there is a slightly browned skin on top and then pudding feels firm to touch because the rice has absorbed most of the milk. When the pudding is cooked, let sit aside and prepare the blueberry sauce by gently bringing all ingredients to the boil in a saucepan. (If you add cornflour add just a little liquid to dissolve it before adding to mixture so it doesn’t get lumpy.) 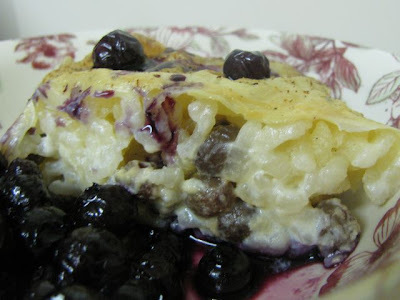 Serve warm rice pudding with warm blueberry sauce. 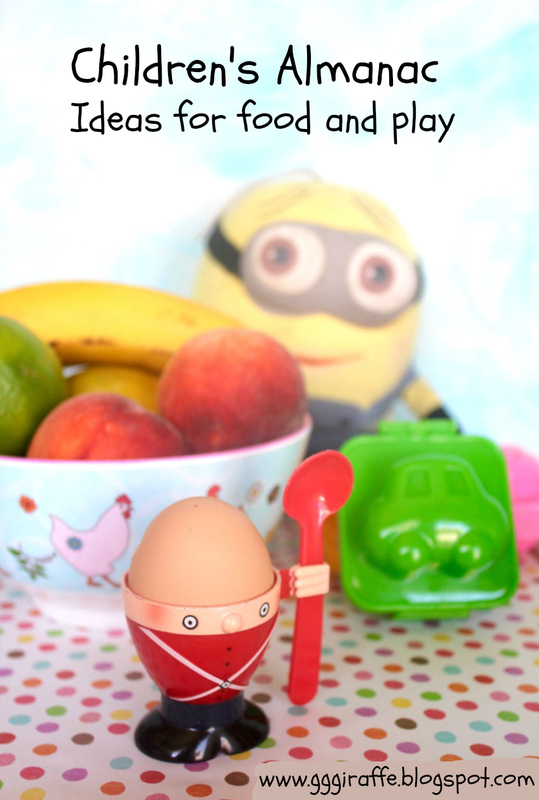 Ilva at Lucilian Delights has started a series called Food Props on Sunday and she has invited bloggers to join in her reflections on the props that surround food in our photos. I can’t resist a bit of navel gazing! I feel that I should start with a disclaimer. I am not in the league of Ilva and her guest posts. I don’t have a studio or an SLR camera or cupboards devoted to ‘props’. I don’t have the time or patience to take photos of breathtaking beauty. Most of my meals are photographed hot in the minutes before eating them. On the other hand, I have taken so many photos of food in the three years since starting this blog that I have learnt a thing or two. Probably the most important thing for you to know about my food photography is that it is a window into my world. I take delight in the curve of a pumpkin or the sheen on an apple but I find that my personal life can’t help but creep into many of my photos. The plates and bowls that I serve on are ones that we use in our daily life. When I have time to set up a photo, I usually look around my house for inspiration. Sometimes it is an ornament, sometimes one of Sylvia’s toys or even a suduko puzzle. 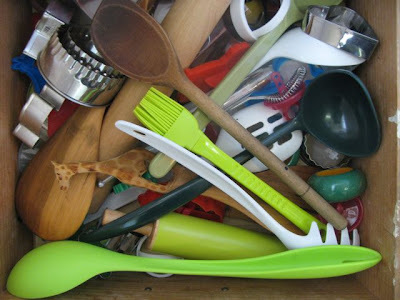 So when thinking about food props, the entire contents of my house seems to be my box of props, though first port of call is always my kitchen. 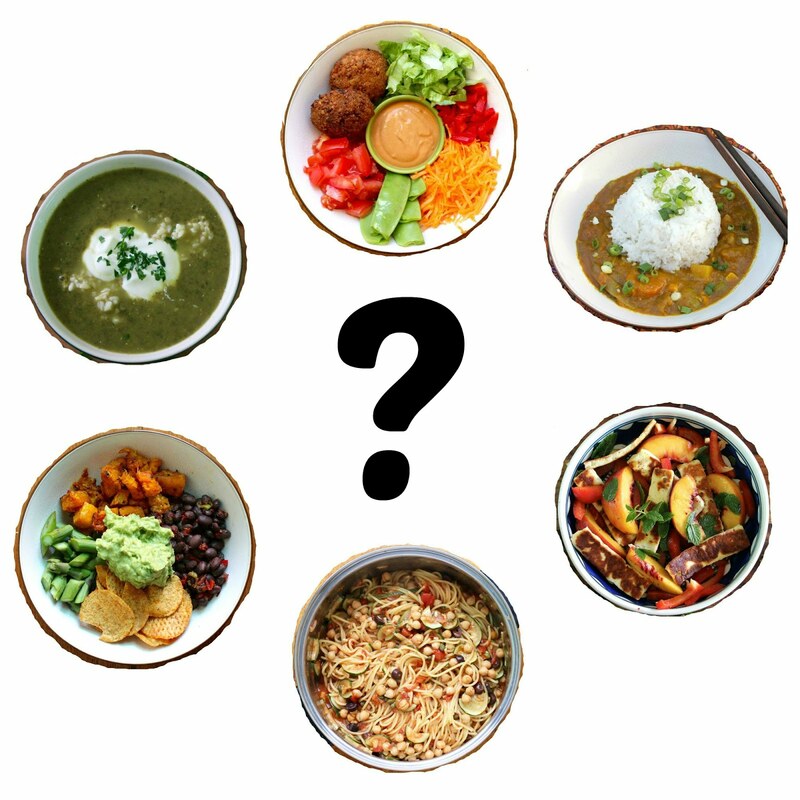 First decision is often a plate, a bowl, a casserole dish or a tea towel. I love colour and patterns. I love bold and pretty and funky. 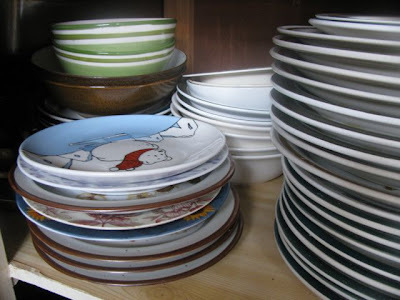 Very few of my crockery is white though my kitchen is not as colourful as I would like. 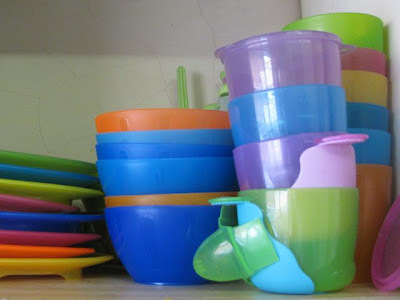 Many of my kitchenware was purchased before blogging. But not all. I rarely buy anything for the kitchen these days without thinking about how it might appear in my food photography. 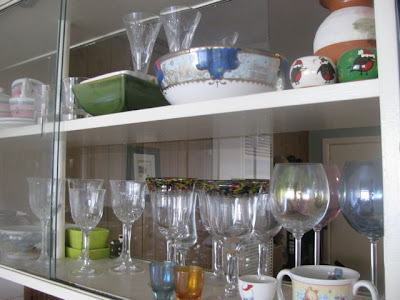 No matter how long I have owned a dish or ornament, when I use it I often find myself filled with memories. 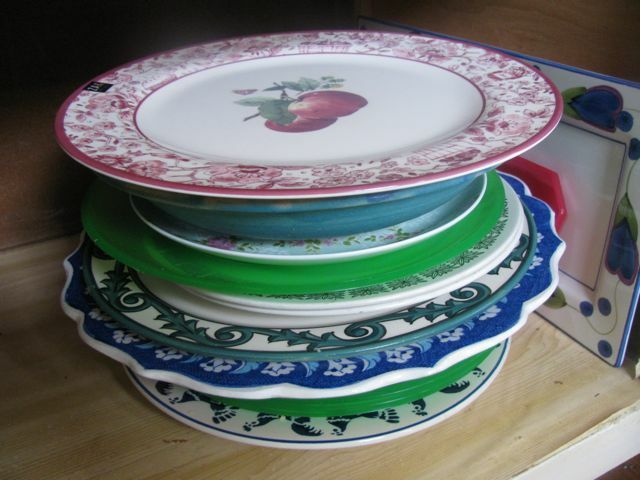 I remember who gave it to me or where it was purchased, or when we used it in a dinner party in a student household. Occasionally I even take photos at other people's houses when the food is shared or prepared there. It gives some new views but most of all captures the memory of the occasion. 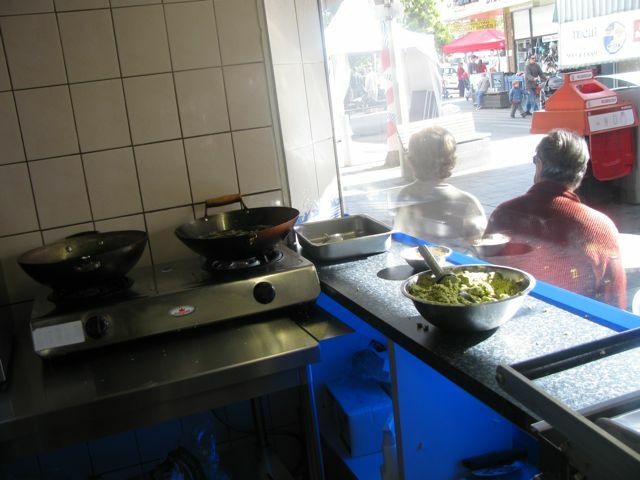 If I have the time, energy and sunlight, I sometimes choose some quirky item to appear in a photo alongside the food. It is often a reminder of that moment in time. A new toy received as a gift, a teething ring that Sylvia has needed that day, a tea towel I have just bought on holidays. I fear that the photos mean much more to me than readers but I hope that we can all enjoy the fun. As you will have already gathered, friends and family are often present in my photos, whether through gifts or memories. Some are more present than others. 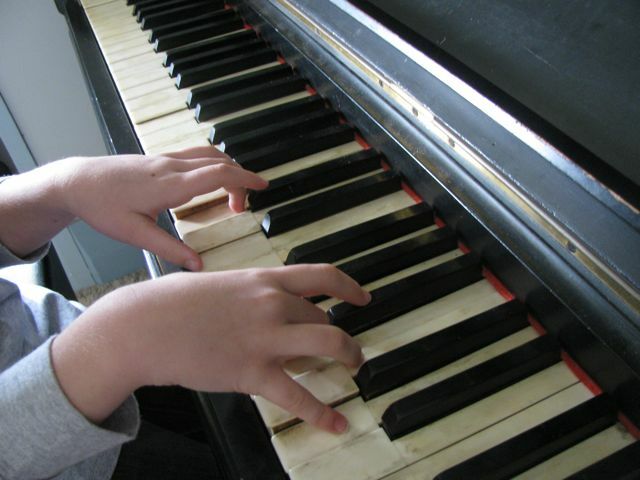 I have a blog policy of no faces but I do love hands. They are so expressive. Often Sylvia is around when I am photographing and her pudgy little hand makes its way into the photo. I love capturing the ephemeral in photos - a gesture, packaging, peels or a scribbled list. 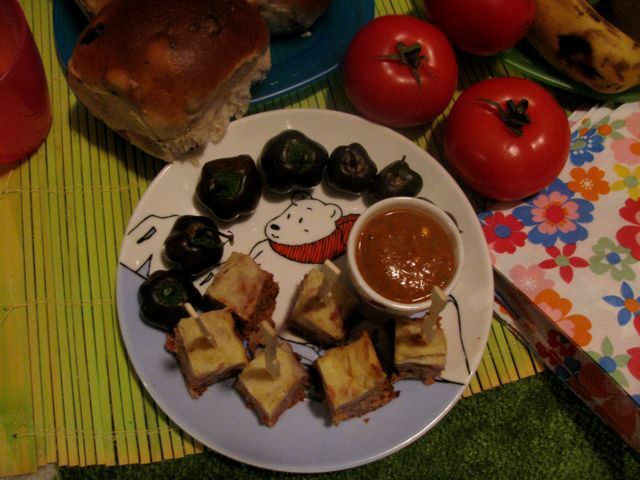 So Ilva, you have asked about my food props. 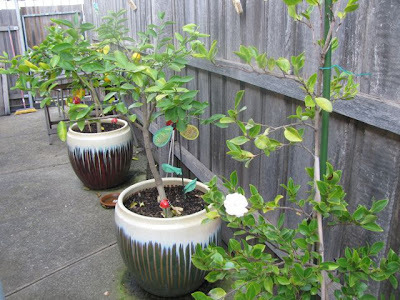 They range from anything that will prevent my soup being a puddle on the floor (to paraphrase Bron Marshall), to the ornaments on the shelves in the loungeroom, to Sylvia's toys, to the backyard plants, to a wee curious hand. My food props are full of colour, of fun, and of meaning. It has been quite a week. In this side of the world it was the winter solstice. In our country, we had the appointment of Australia’s first female Prime Minister. In our house we had many chocolate treats, a soup that reminded me of gravy and a nut roast that gave the soup new life as a sauce. 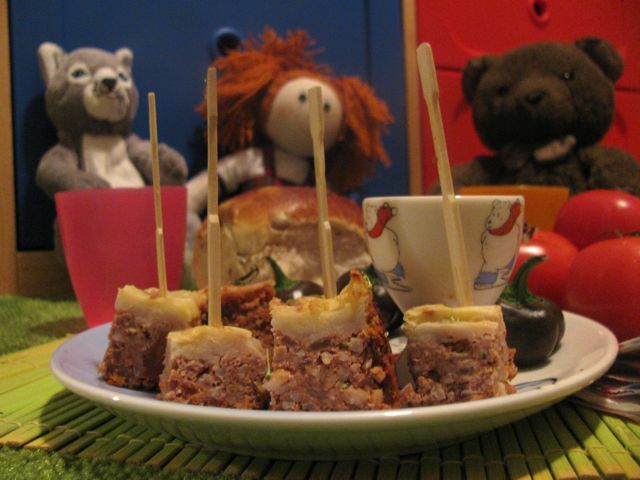 The nut roast may have been inspired by the soup and a celebration of the solstice, but it was also the perfect offering for a virtual picnic. 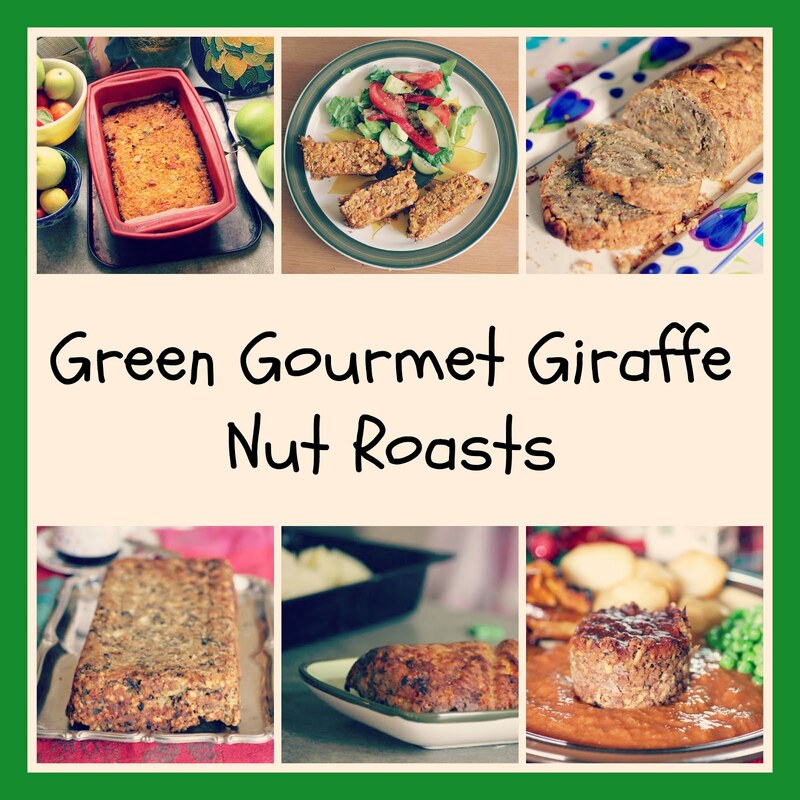 I found the nut roast recipe many months ago via the International Vegetarian Union list of cookbooks. I love browsing the historic cookbooks and found one called Modern Meatless Cookbook: five hundred recipes for preparing food with special reference to cooking without meat published by the House of Rest, San Jose California in 1907. 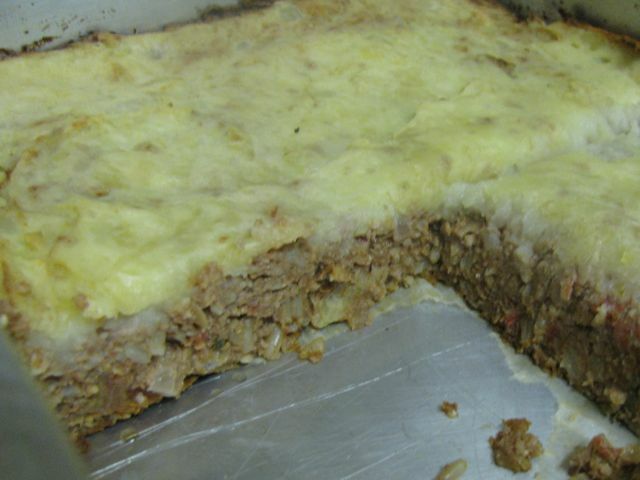 The idea of baking a nut roast covered in mashed potato appealed in a daggy retro sort of way. The minimal instructions in these recipes always scares me a little. This one had all of two sentences: “Mold into a roll. Spread with a covering of mashed potatoes and bake in slow oven until well browned.” It was not quite that simple. So I have modernised the recipe a bit in my adaption. Though the recipe looked straightforward, there were many components and it took me some hours to make. 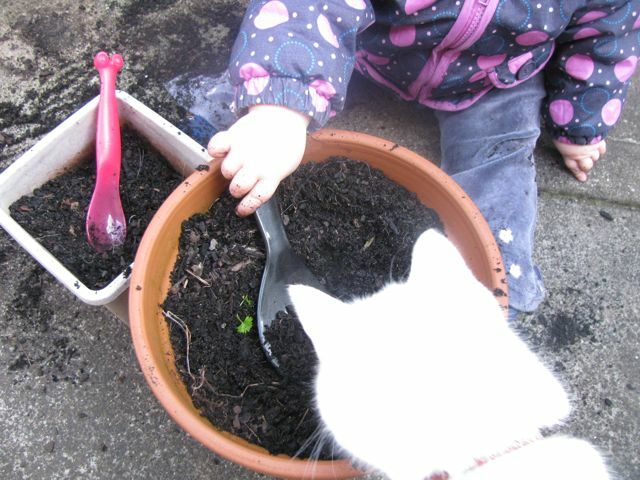 I started cracking the walnuts mid afternoon while Sylvia insisted on staying outside in the garden and digging in some pots of dirt. 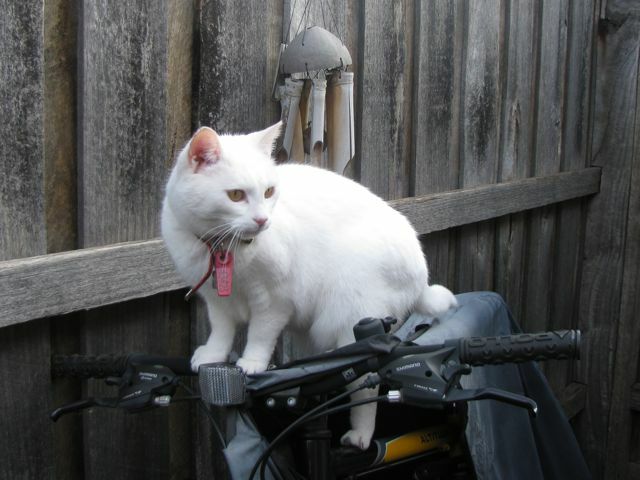 Zinc ran around like a crazy cat looking for new places to explore. She managed to climb on the handle bars of E’s neglected bike and looked for all the world like she was trying to figure out how to work the damned contraption. When I first found the recipe, I had intended to serve it with this sherry gravy. Meanwhile I made a pumpkin soup with some leftover beetroot and rhubarb crumble. It wasn’t quite right and seemed more gravy than soup. In fact, I felt it was in need of a nut roast and hence dug out this recipe. The smooth well seasoned sauce with a hint of piquancy was perfect. 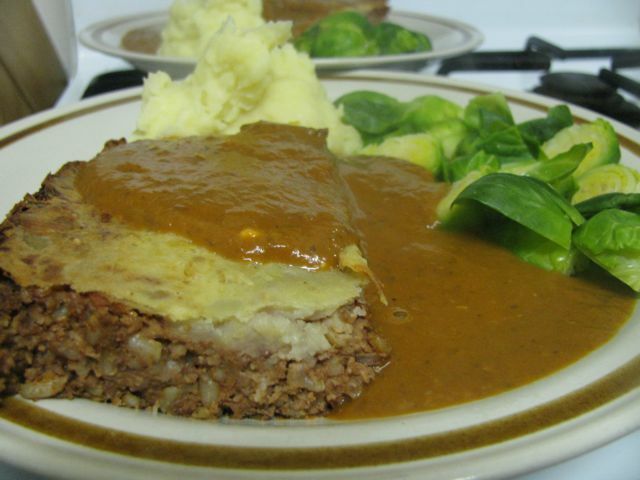 It pooled around the slab of nut roast the mound of mashed potato and the pile of brussel sprouts. It was a great way to include more vegies in the meal. One thing I loved about the nut roast was the crispy little layer of mashed potato. In fact when I sliced it up I thought it would make great finger food. I knew the Louise was holding a virtual picnic and thought she would love some nutroast. Hence my special picnic photos (which are actually taken at night as it is winter here but just ignore that and admire the little capsicums and tomatoes from my mum's garden). 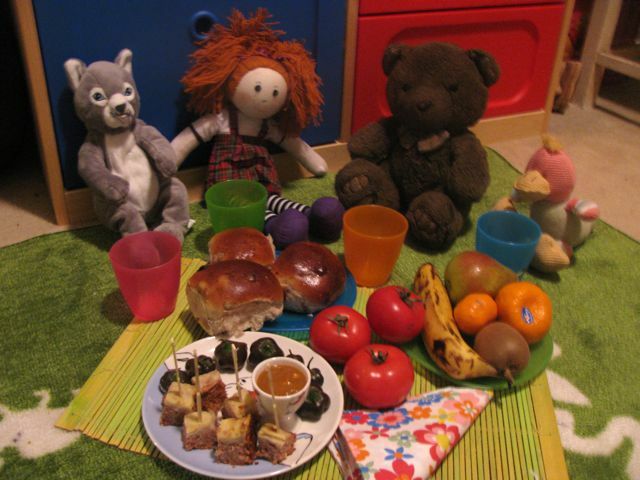 Louise will post the whole picnic alphabet on Thursday 1 July so be sure to visit to check it out. I will also fill in the dishes as they are posted for A-M. For those of you who haven’t yet discovered Louise's wonderful blog, you will also find lots of fascinating information on food being celebrated each day, week and month. The picnic game celebrates National Picnic Month in July in the USA. 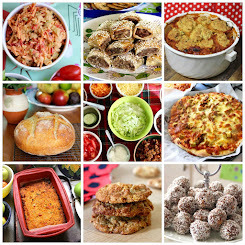 But I think my favourite celebration I have seen on her blog lately is Kitchen Klutzes of America Day (13 June). Mix nuts, brown rice, breadcrumbs, fried onions, eggs, sage leaves, tomatoes and seasoning. Adjust seasoning according to taste. The recipe said to mould into a roll and cover with mashed potatoes. My mixture was not that firm so I decided to spread it in a lined and greased 22cm square tin and spreading a thin layer of mashed potato over the top. I baked the nut roast in the oven at 170 C for about 50 minutes and then for 15-20 minutes at 220 C until the mashed potato was browned and starting to crisp up. It reheated well the next night in the oven without any foil over it because mine wasn't that brown. 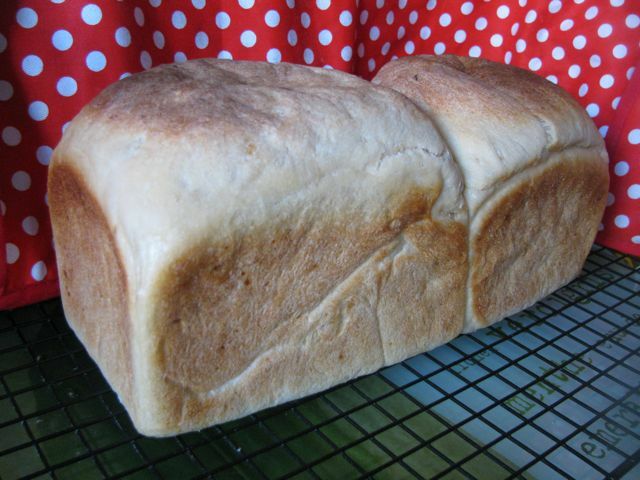 I have recently raved about Dan Lepard’s and Jim Lahey’s slower methods for baking bread. 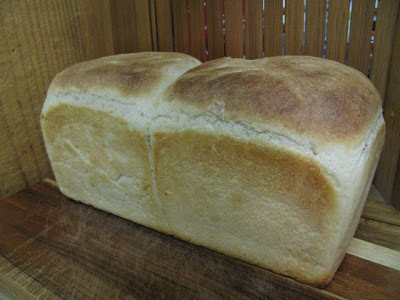 However, there is one more traditional bread recipe that I have made a few times now which makes excellent soft but substantial white bread. It is Nigella Lawson’s Potato Bread. Growing up on a meat and three veg diet, I ate a lot of mashed potato. Some days I wish I made it more just so I could have leftover mashed potato for baking. Sometimes I make it just for baking because it makes baked goods taste better. I love baking with mashed potato. It binds and moistens. Our foremothers knew this and would use potatoes in bread. I found a great blog summary of Elizabeth David’s writing on the history of potatoes in bread the 19th Century. Apparently potaotes were used to bulk up bread during a grain shortage and to help ferment the yeast. 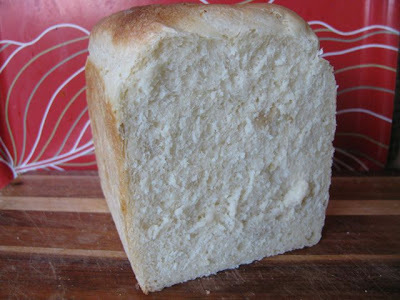 Nigella knows its importance and recommends using potato water in any loaf of bread in place of plain water but she goes further and includes a recipe for bread made with mashed potato. I found a photo of this potato bread that I made just before I started blogging (above). It was obviously taken before I discovered the close up button on my camera and learned how to take photos with food in focus. It tasted good. My more recent photos of this potato bread reflect the taste far more successfully. Since making my first loaf of potato bread quite a few years ago, I have learned a lot about baking with yeast. I credit some of this to Dan Leapard and Jim Lahey, some to experience and some to a recent Masterchef Masterclass. I have learned that salt retards growth as well as give flavour, slow rising gives better flavour and the water doesn’t have to be lukewarm. What amazed me was the advice in the Masterchef masterclass saying that the dough should be treated gently. It seems some people treat it to delicate folding rather than treating it like a punching bag. I was glad to see Nigella recommend that you give the dough a good thwack with your fist after the first rise to let the air out of the dough and any frustrations out of your system..
My one problem with the recipe when I made it earlier this year was that I found it very salty. The next time I made it, I reduced the salt from a tablespoon to 2 teaspoons and preferred it less salty. Less salt didn’t seem to make it rise quicker. Mine took 2 hours till it seemed risen enough, rather than the hour that Nigella suggested. I found that when I used leftover mashed potatoes that didn’t quite make up the 300g specified in the recipe, I needed less flour but the recipe worked fine. I also used potatoes mashed with their skins on and again there was no problem if you don’t mind seeing the grey flecks of skin in the finished loaf (see in above photo). I also used buttermilk instead of yoghurt and it was a fine substitute. The last time I made this bread was the day before E left for Scotland in May. It felt good to give him some substantial food before stepping onto a plane to eat food out of little plastic boxes. When he arrived it was about 12 C in Scotland and 20 C in Melbourne despite it being late autumn here and late spring there. Before it got warmer there the rain turned to sleet. Though I have lived in Edinburgh a few years, I still get amazed at how cold it is. No wonder E thinks a home should have central heating on all year round. But when it comes to bread baking, it raises the question of what is meant when a recipe calls for bread to rise at room temperature. 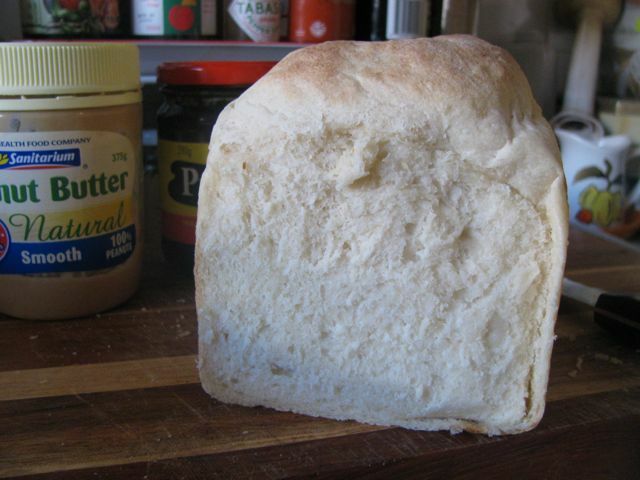 Whatever your climate, I high recommend you try this bread. It is proof that the simple things in life are often the best. I am sending this to Susan for YeastSpotting, her weekly round up of yeasty baking around the blogosphere. Mash the potatoes and mix in about 600g flour, salt and yeast. Add yoghurt and water slowly. Tip out the shaggy dough onto a floured surface and knead for about 12 minutes, adding in flour as kneaded. As much as 200g extra might be needed, according to Nigella. She also notes that the dough is damper and heavier than regular white bread but I found it will become nice and smooth. 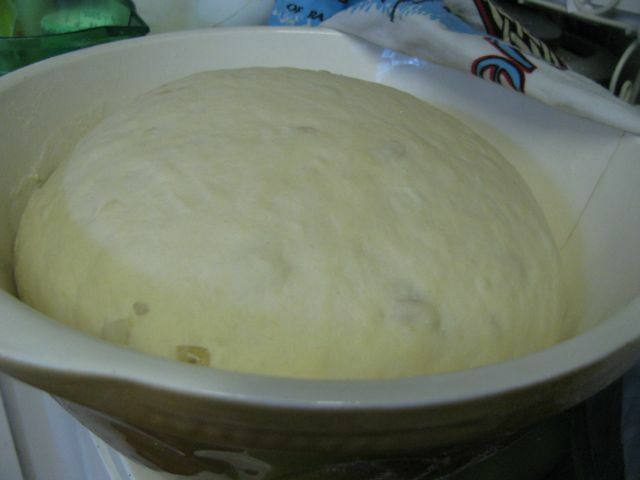 Place dough in large greased mixing bowl, cover with cling wrap and set aside for about an hour to double in size. Nigella also says it can be set aside overnight in a cold place – I guess this means in the fridge or on the windowsill in winter! NB: It took me 2 hours at room temperature in autumn. When the dough is risen, punch it down and knead for about a minute. Form into a loaf in your preferred shape – I have shaped this into a round loaf on a baking tray and into a regular squared bread loaf in a bread tin – both lightly greased. Lightly cover with a teatowel and leave to rise for about 30 minutes until almost doubled in size. NB: It took me 40 minutes. While bread is rising, preheat oven to 220 C. Place risen loaf (no glaze required) in oven for about 20 minutes and then turn temperature down to 190 C and bake another 10 minutes. I have found that when baking in a bread tin, I tip it out towards the end of cooking, place it back in the tin upside down to make sure the bottom is a nice golden brown, even if the top looks slightly squished. The last week has been one of highs and lows. The joys of good cooking followed by the disappointment that we were too sick to feel like eating it. The fun of playing with my nieces on a holiday, which ended all too soon. So let me take you back to last Monday, the Queens Birthday holiday, when Sylvia and I visited my family in Geelong. We arrived at my mum and dad's on Sunday night but after seeing Ashton and family, were too late to see my sister Susie’s girls. So on Monday morning they came over. Sylvia loved it. Next to them, her eating doesn’t seem quite so fussy. (Though throwing half a bowl of baked beans on the floor is a new low in her eating!) She had little cousins to push her on the swing, protect her from my folks’ dog Woody (who caused her to cry and cry) and amuse her in any way they could. 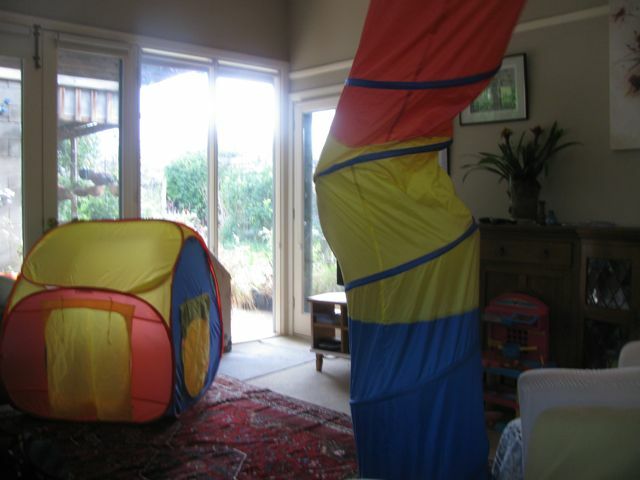 Susie brought over an old fabric tunnel for Sylvia to play in but she wasn’t too interested. Grace and Ella had a great time playing in their old tunnel. 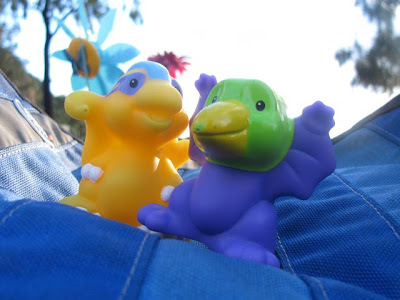 Interesting how kids can find new fun in old toys. Meanwhile I rekindled an old interest (thanks to a bit of research on the web) and showed Maddy how to latch hook. These girls love to play with my camera so here is a photo that we took of Maddy’s hands. You can see they are hands that love to create and craft. All too soon the girls had to go home for lunch and Sylvia was tired so we hoped in the car so she could have a sleep on the way home. I brought mum’s cooking with me – a lovely honey gingerbread and leftover spanakopita. Mum had served the spanakopita on Sunday night with an eggplant dish like this one but I had other ideas for how to serve the remains. 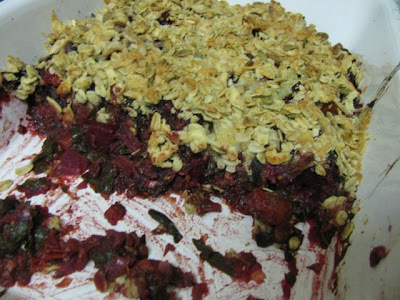 I had decided to make a crumble using the remains of my beetroot and rhubarb that I had bought for the recent beetroot and rhubarb soup. Making the soup had helped me understand how rhubarb acted in a similar way to lemon in a savoury dish. I have used mustard with rhubarb before and knew that would work. So I started chopping up vegetables and thinking about other flavours. I had some horrid tomatoes that were only good for cooking and bits of cheese and seeds that had been hanging around for a while. When I told E I was doing a vegetable crumble, he asked what was in it. Just whatever is in the fridge and needs using, I replied. Once I had all the scraps of vegetables in the mix, there was very little need for any additional flavouring as it was already quite tasty. It was surprisingly good though quite intense. It was an excellent accompaniment to mum’s spanakopita. 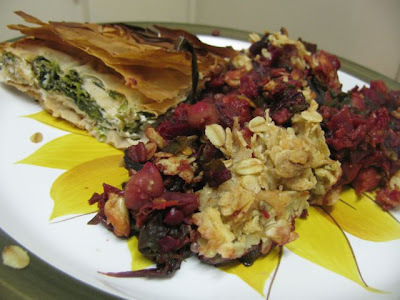 It was an excellent way to use up bits and pieces from the crisper like mushrooms, cabbage and beet greens. But after two nights our stomach turned against such flavoursome food. I put it in the freezer and have added a little tub of crumble into a pumpkin soup tonight. On the same night that I made the crumble I satisfied a hankering for a chocolate sour cream cake. 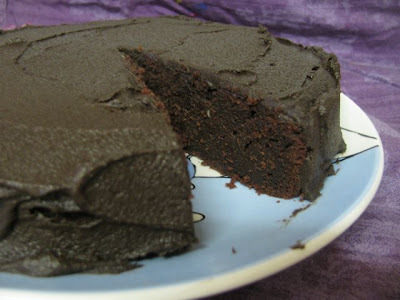 I have felt the need to find a good recipe for such a cake ever since I bought some sour cream quite some weeks ago. The sour cream had been used up before I first spied Smitten Kitchen’s recipe for Sour Cream-Chocolate Cake with Peanut Butter Frosting and Chocolate-Peanut Butter Glaze and then saw Carla make a vegan version with some of her vegan sour cream. I had been fascinated by the sour cream that Carla first made with tofu, mustard, dill and garlic because it also included umeboshi vinegar. I have a bottle of the vinegar that I bought on a whim ages ago and struggle to find uses for. I was interested to see Carla revisiting the tofu sour cream in a cake. I had to try this. It tasted slightly of tofu. But, following Carla’s instructions to use Japanese silken tofu, I got a wonderful creamy concoction that you can see in my recent soup. The cake is one of those soft moussey fudgy cakes that is dark with lots of cocoa. I took one out to taste and let the other cool in the tin overnight. Both cracked but possibly due to my decision to use two rather than three cake tins. Even without frosting, it is quite rich. Some of this one was sent some home to my dad, some came to work with my lunch and we still have about half a cake that is edible. It is a cake that with all the frosting could be made as a special cake but without it, is one that can knock about the house and linger in the freezer. I enjoyed the tofu substitution for added protein and less fat. 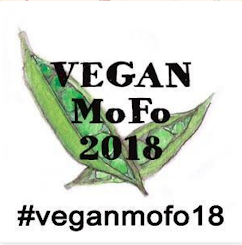 All in all, it has been fun experimenting with some new flavours and vegan substitutes but my advice is that this is not recommended in times of a delicate stomach. This time last year: What does home mean to you? Heat oil in a large frypan and cook onions for about 5 minutes over medium heat. Add beetroot, carrots, celery and cook for about 15 minutes. Add garlic, salt, cabbage, beet greens, mushrooms, chickpeas, and lentils. Cook for about 10 minutes. 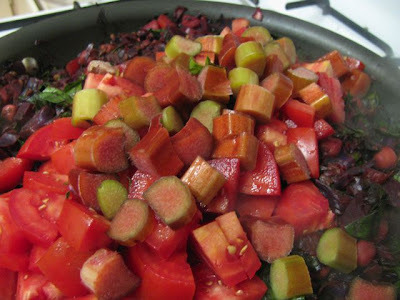 Add tomatoes, rhubarb and water. Cook for 5-15 minutes until all vegetables are cooked and most of the water is absorbed into a nice sauce. It took me about 45 minutes from when I started cooking the onions but I noticed the beetroot were cooked after about 30 minutes so you could possibly do it in less time than me. When vegetables are cooked, tip into casserole dish. Bake at about 200 C for about 30-45 minutes until crumble is crisp and golden brown. 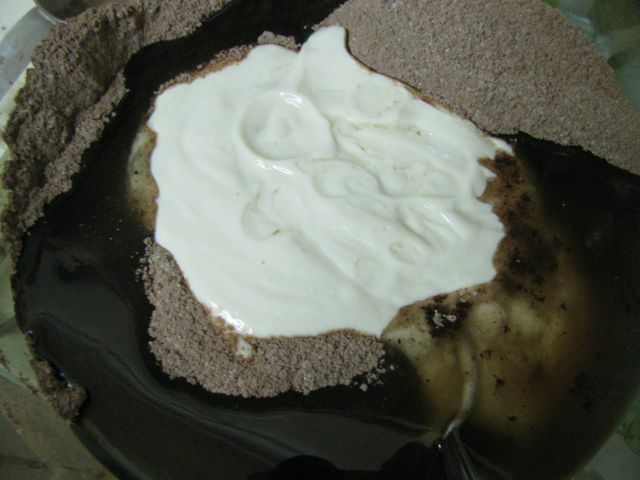 Mix the flour, sugar, cocoa powder, baking soda, and salt into a large bowl. Stir in the oil and sour cream to make a very stiff mixture. Then gradually beat in the water. The mixture will now be quite liquid. Stir in the vinegar, vanilla and eggs to make a glossy slightly thickened batter. Pour batter into prepared cake tins. Bake for 30-35 minutes if using 3 cake tins. If you are using 2 cake tins like I did it will take considerably longer – I think it took me another 20-30 minutes. You will know when it is ready because the middle will spring back when touched and a skewer inserted in the middle will come out almost clean. Cool in cake tins for at least 20 minutes or until cold. It can be eaten with or without frosting or icing. I used a chocolate buttercream frosting which I found very rich. I can’t imagine how rich it would be with the original recipe which called for a cream cheese peanut butter frosting and a chocolate frosting! Keep in an airtight container. After a week our cake is still quite edible though past its best. 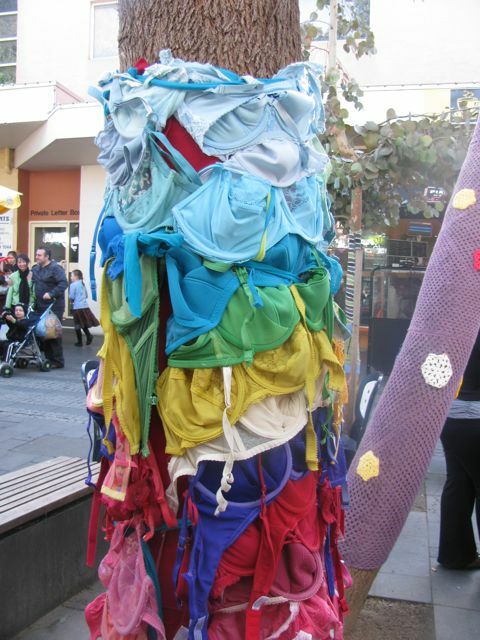 This morning, after Sylvia’s swimming lessons, we found a table and chairs in the Victoria Street Mall to partake of a falafel brunch and join the crowds who were enjoying the good cheer of the Coburg Carnivale. It was a pleasant morning with the gentle warmth of the winter sun making the cold weather bearable. 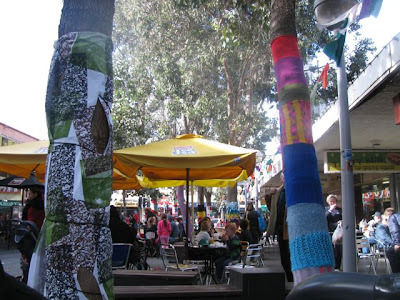 We were well rugged up in our winter woollens, as were many of the trees. 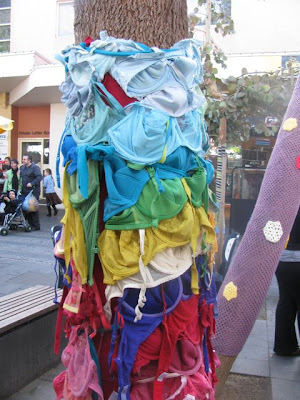 Artists had wrapped tree trunks in a variety of fabrics, though my favourite was this jaunty one below that, on closer inspection, was layer upon layer of bras. The decorations helped give a festive air to the area. At one end of the mall was a marquee for the performers and at the others was a scouts sausage sizzle. 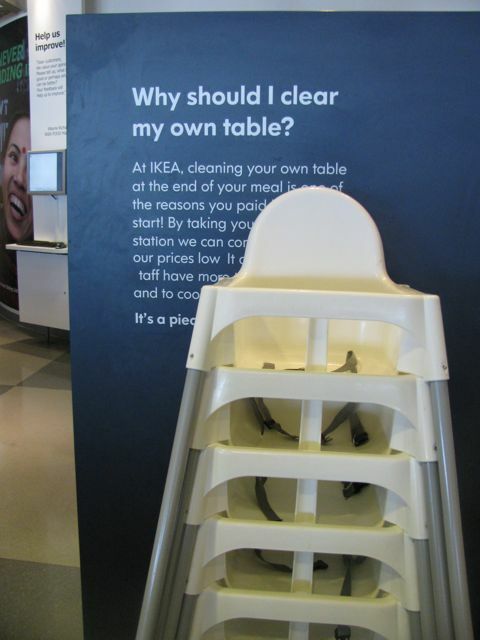 In between is a obstacle course of tables and chairs , prams and wheelchairs. 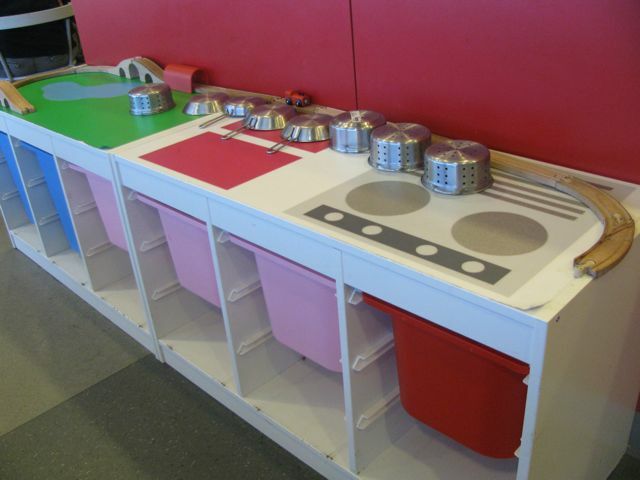 It is a gathering place for families, the elderly, and students. Little children brandished plastic windmills and chased pigeons. Old men gathered around a table over coffees, generating a haze of cigarette smoke. Dogs were kept on their leash lest they add to the mayhem. Street performers ran around with dice on their heads, mothers found themselves dancing with ribbons, a Thai dancer passed us by, an old man played on his gum leaf and showed others how to. Meanwhile, on the stage someone was singing Bollywood songs. 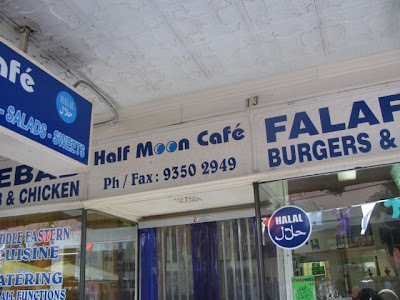 There is a tyranny of choice for food in the mall but I often find myself heading for the Egyptian-style falafels at the Half Moon Café. 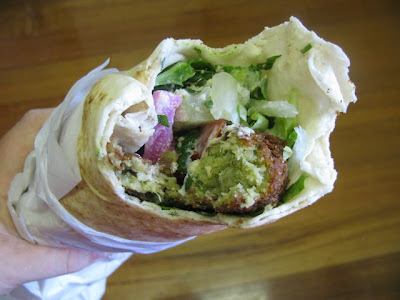 Sometimes I buy them in a traditional pita wrap of falafel with lettuce, rocket, tomato, pickled vegetables and tahini. Other days I just buy the falafel pieces to take home for a salad sandwich. 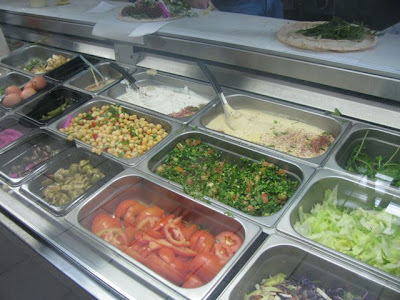 The falafels are made on the spot. I enjoy watching the patties of fava beans and herbs being shaped from a bowl of mixture and lowered into the oil to fry. They are soft and green inside and crisp on the outside. It is worth waiting for 5 or 10 minutes to eat them warm from the fryer. Even when busy, the staff are always pleasant. I have seen other places claiming to be the best falafels in Sydney Road but this is my favourite place. I am not alone in my choice. Half Moon Café has earned itself The Age’s 2010 Cheap Eats award for the best vegetarian dish in Melbourne. 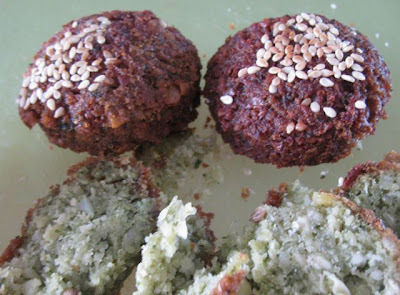 They are called the ‘holy grail’ of falafels not just for their great taste but also for boasting 5 different falafel options (not counting the specials). Boiled egg, black olives, tabouli, and feta cheese all feature in the falafel menu. From the outside the place does not look impressive. (Today for the first time I noticed that the verandahs have pressed metal ceilings.) Inside the wood panelled walls, assorted pictures and lanterns are welcoming. However it is a small space that fills up quickly when busy. There are a few small tables and chairs but I have never eaten inside. It never seems as desirable as sitting outside with so much space and so many interesting folk to watch. 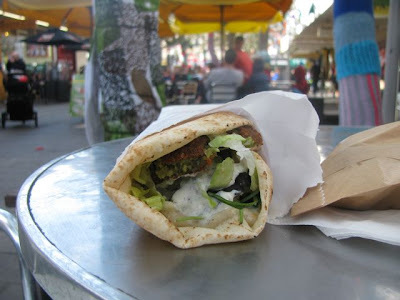 Today I chose the special: falafel, lettuce, rocket, cauliflower, eggplant, and yoghurt dips. It wasn’t as excellent as the traditional one but I enjoyed a change and some interesting vegetables. I think I missed the pickles that I usually have in my falafel. 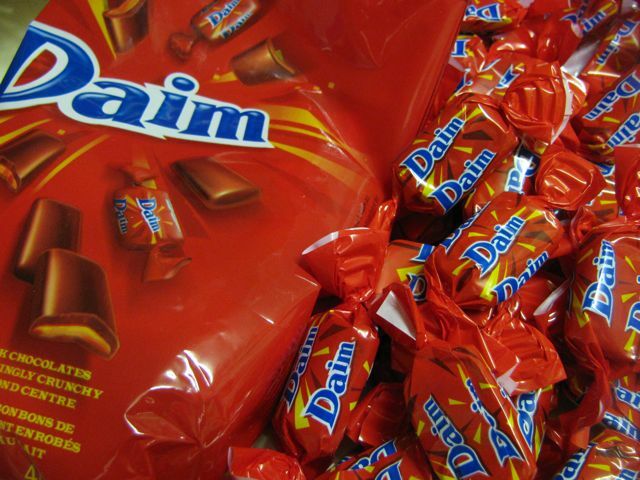 Their acidic bite balances the rich creaminess of the tahini. I also observed others with chips and lovely plates of salads and pita bread. (E unwisely decided to purchase his brunch elsewhere!) Cindy and Michael also recommend the creamy “foul medames”. I bought a bag of three falafels for Sylvia. She has eaten them in the past but is getting so fussy I wasn’t sure if she would be interested. 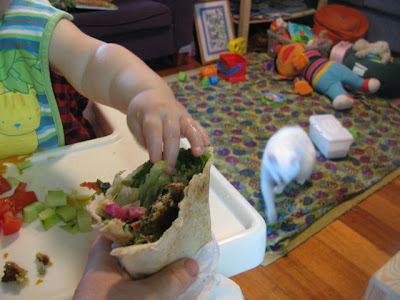 She tried a chunk I gave her and loved it so much that she kept looking for more until she had eaten a whole falafel. I shouldn’t have been surprised. After all these are surely the best falafels in Coburg. 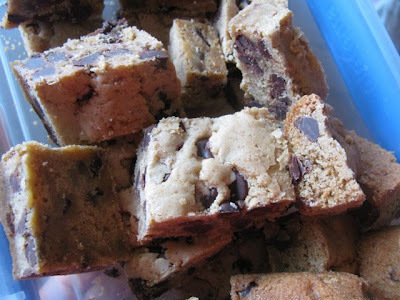 When I read that Susan of The Well Seasoned Cook was hosting the Sugar High Friday event (created by Jennifer, The Domestic Goddess) with a theme of cookie bars, I saw a window of opportunity open. I grew up with 'slices' not tray bakes or bars but have embraced choc chip cookies with a passion. I was interested to see how they would work as a ‘bar’. 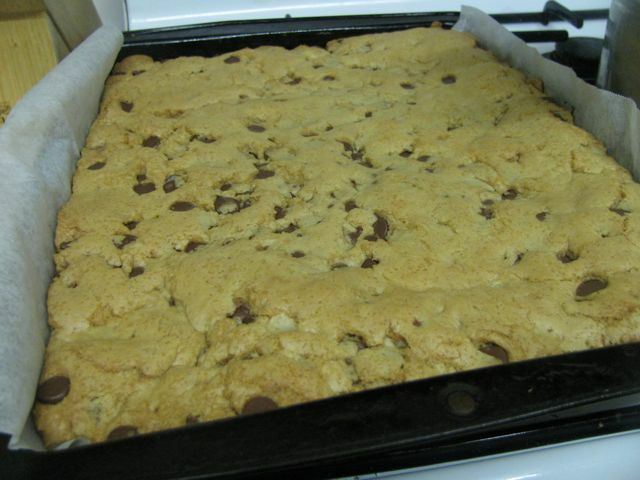 I searched the internet for a recipe that would make bars that tasted just as good as choc chip cookies. I found a recipe for Thick and Chewy Chocolate Chip Bars on My Kitchen Café which had come from Cook’s Illustrated and been tried by a few other bloggers. It was the choc chip cookie bars that was the winning recipe. The mixture looked right and when it came out of the oven in the evening I exercised some self control but decided to try them warm before I went to bed. It was so so so good. I gave E a taste and he said I should just give Andy and Erica the zucchini slice. Of course I took them most of the choc chip cookie bars as well as the zucchini slice. Ashton was so tiny and all swaddled up in a rug against the winter cold. She lay in my arms sleeping for most of our visit. Her big brother, Cooper, and Sylvia weren’t too fussed about the baby. They were more interested in sitting at the little table and sharing food. Once Cooper saw the bars he wasn’t happy until he got one. But he did give Sylvia a small piece. They both devoured them enthusiastically. 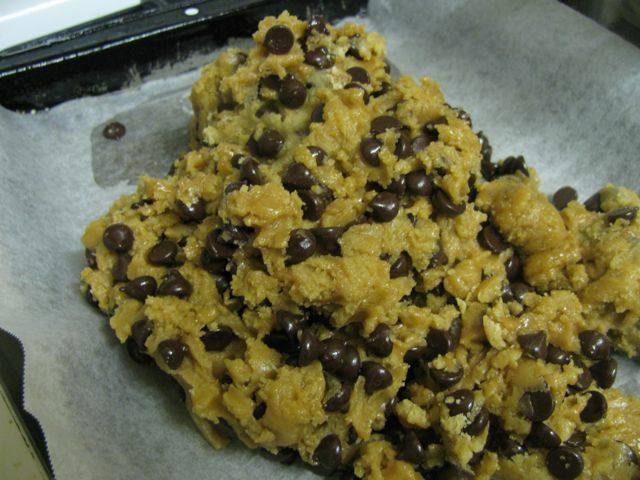 I am sold on making choc chip cookies in bars. Though they take longer to cook and longer to cool this is not necessarily a bad thing. I often forget about cookies because their cooking time is so short and I often struggle to find room for a big batch to cool on a wire rack. It also saves time on spooning out individual cookies and having to bake in a few batches as they usually don’t all fit in my oven's top shelf. So I think the bars are more convenient although once sliced into bars they are a little more fragile. But the most important thing is just how good these taste. 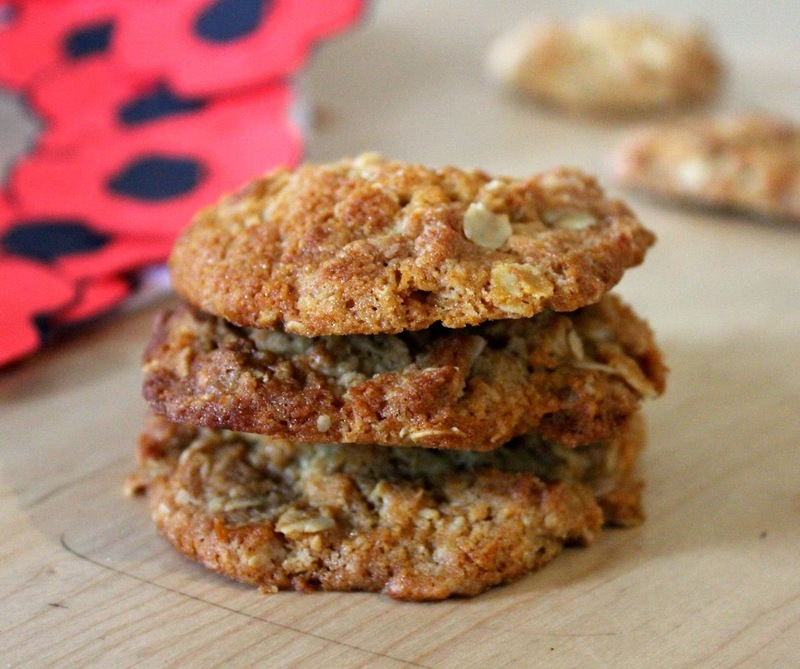 They are indeed chewy, buttery and packed with chocolate. 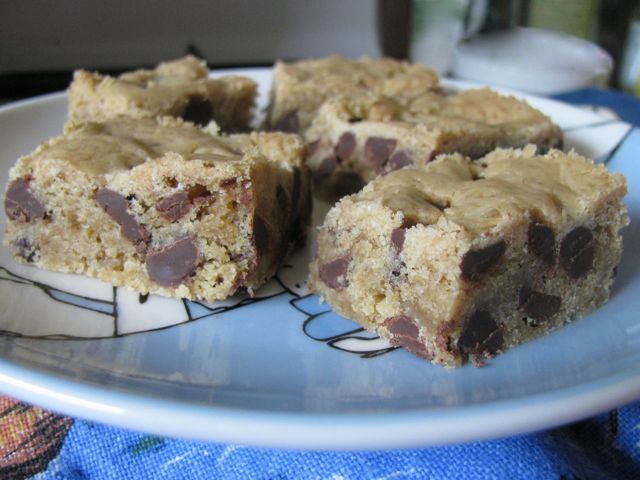 I think I could just about call these blondies, especially if I used butterscotch chips or white choc chips. Alternatively you could see it as a giant cookie. But whatever they are called, this recipe is definitely a keeper! Preheat the oven to 160 C (325 F). 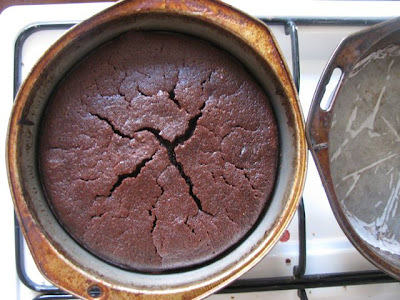 Grease and line a 9 x 13-inch baking pan (lamington tin). Melt butter in a large mixing bowl and stir in the brown sugar. Mix in the egg, egg yolk and vanilla. Add flour, salt and bicarb of soda and gently mix until almost combined. Add choc chops and stir in until just combined. It will be a stiff mixture. Spread mixture into the lamington tin and use the back of the spoon to smooth down. Bake for 24-28 minutes or until top is light golden brown and the mixture edges are pulling away from the sides of the pan. I have recently finished reading the second novel in Stieg Larsson's Millennium trilogy, The Girl Who Played with Fire. It is set in Stockholm, a city of which I know nothing. The streets, the police force, the newspapers are all foreign to me but when our protagonist, Lisbeth Sallander outfits her new apartment with furniture from Ikea, it suddenly seems all too familiar. 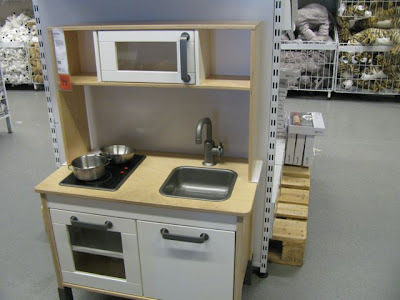 Every now and again, we venture into the overwhelming world of Ikea with its cheap flat pack furniture that is like lego for adults. Lately, though, I have been more taken with the kiddie section, especially this wonderful toy kitchen that I would have loved as a kid. 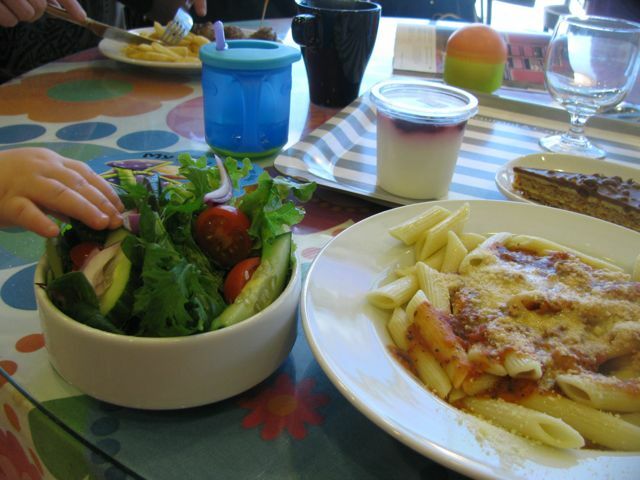 So a few months back we decided to have lunch at the cafe before making our purchases. 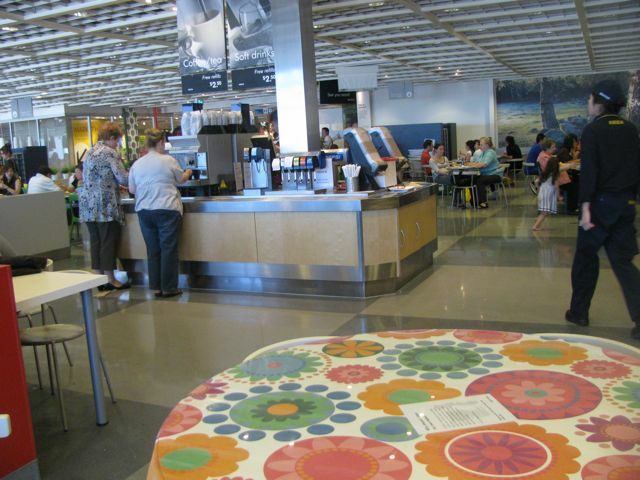 (NB on the website it is called a restaurant but it is more a cafeteria.) It was convenient, it was cute, it was cheap but it was not really geared towards anyone who wasn't a carnivore. The queue was very slow to snake past the displays of food but there wasn't much on offer for me. 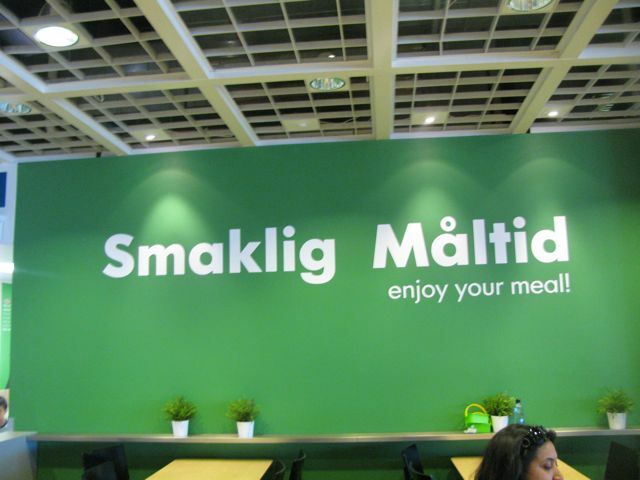 E had the famous Swedish meatballs and enjoyed them. I have heard varying feedback on them and would welcome a veg version but am not sure that would ever happen. It isn't that sort of world. The sign is friendly enough but it is a place where you must fit the mould, rather than them catering to anyone who is outside their idea of 'normal'. That is how they manage to be so cheap but it makes for a very limited welcome. Service is minimal too. I ordered a pasta with tomato sauce and a sprinkle of parmesan cheese and a side salad. 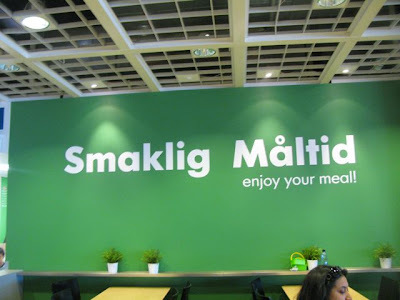 The tomato sauce was bland, the cheese was just salty sawdust and the salad was a cheap forest of green leaves with a couple of pieces of tomato and cucumber in it. Very unsatisfying. Sylvia was not impressed, despite sitting in a highchair just like her one at home. One of the unfortunate side effects of being vegetarian is an excitement at dessert in lieu of any decent main course. 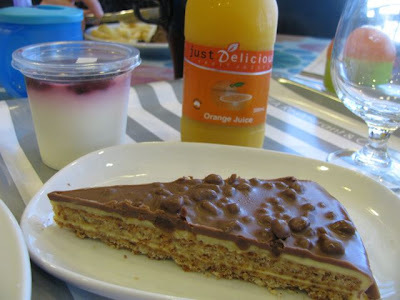 We ordered a slice of daim slice and a yoghurt with ligonberries. I had thought Sylvia might try the yoghurt but none of us were too enthused with it. E and I, on the other hand, loved the cake - with its layers of creamy, crispy, chocolatey yumminess. 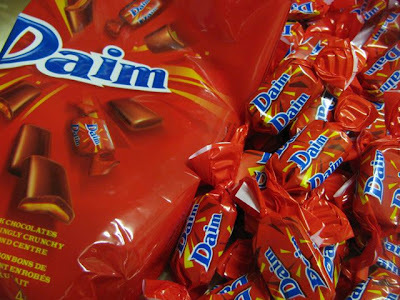 I was curious enough to buy a packet of the Daim lollies that I assume the slice was imitating. They were very crunchy, being a hard almond toffee covered with chocolate. Not something I would buy again. I could be tempted by the slice if ever I set foot in the Ikea cafe again. However, I don't have any desire to go there again. Though it is convenient, I can find more nutritious and delicious food in the downstairs shopping centre at the Richmond store that we visit. What I do love about the cafe is some of the decor. 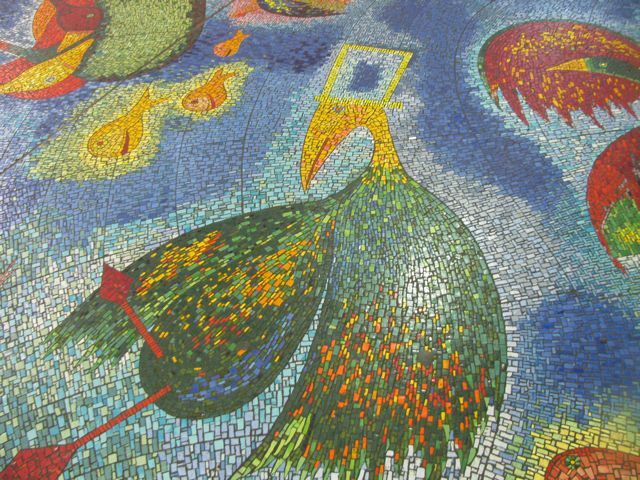 The floral table coverings, the highchairs, the view of St Pat's Cathedral, and most of all, one of the best kids play areas. Well, if Ikea can't get this right, who can! Just a shame about the vegetarian food!